Take travel to new heights at SpringHill Suites Baton Rouge North/Airport. 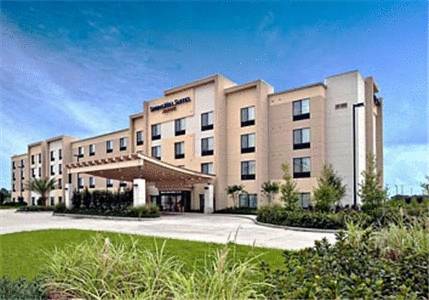 Sitting just a short drive away from Baton Rouge Airport, our conveniently located Baton Rouge hotel puts guests within reach of the area's top attractions including Southern University, Baton Rouge River Center & LSU's iconic Tiger Stadium. We take the stress out of travel with exceptional service & an array of thoughtful amenities like complimentary airport shuttle service, a fresh & free breakfast buffet each morning & a full-service business center! After a day of hard work or play, retreat to spacious suites featuring comfy pillowtop mattresses, premium Paul Mitchell bath products & inviting living spaces complete with work desks & Smart TVs with streaming capabilities. Workout when you want with 24-hour access to our onsite fitness center or unwind with a dip in our refreshing outdoor pool. No matter what brings you to the bayou, experience style & space redefined at the SpringHill Suites Baton Rouge Airport hotel!